While facing a string of defeats in its core territories, but in Libya, the Islamic State (IS) continues to advance on key oil facilities in the country. On January 4, the militant group began an attack east from its home base around Sirte. On January 5, IS was in control of the oil tanks and their immediate surroundings. The group announced the capture of Bin Jawad, 30km (19 miles) west of Sidra on the road from its stronghold in Sirte. It’s a significant achievement. Evidently, the seizure of yet another population centre by the group is concerning. It has continued onwards from Bin Jawad towards the towns of Sidra and Ras Lanuf – the Libya’s biggest oil ports, capable of shipping more than 500,000 barrels a day. Although they have been closed for just over a year they have vital crude oil storage facilities. The capture of the ports would enable the terrorist group to supplement its revenue with money made from the oil products trade in a similar fashion to its counterparts in Syria. The jihadis could make gains inland and towards the east, putting at risk terminals at Brega and Zueitina, as well as a cluster of oilfields, such as Amal and Nafoora, that have enabled two-thirds of Libya’s current production. Libya's National Oil Company (NOC) made a desperate appeal for help on Jan.5 after Islamic State fighters clashed with forces guarding key oil terminals, shelling storage facilities and setting oil tanks on fire», the Financial Times reported. «We are helpless and not being able to do anything against this deliberate destruction to the oil installations in Es-Sider (Sidra) and Ras Lanuf», NOC said in what it titled a «Cry for Help» on its website. After banding together with local fighters, the group began to rapidly expand its reach out from Sirte and towards the rest of the surrounding region. 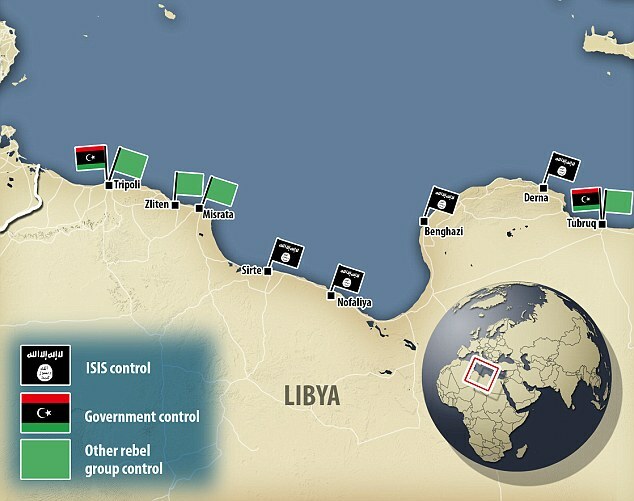 Approximately 125 miles of territory along the Libyan coast is under de facto IS control. IS’s consolidation of territory in Sirte gives the group a foothold in close proximity to Europe — and near a number of potentially fragile neighboring states. Patrick Johnston, a counterterrorism analyst at the RAND Corporation, also told the USA Today that «Libya is probably right now the most significant threat to becoming a full-blown sanctuary» for IS. Libya has had rival administrations since August 2014, when an Islamist-backed militia alliance overran Tripoli, forcing the government to take refuge in the east. The UN is pressing both sides to accept a power-sharing agreement it hopes will help reverse gains made by IS. On December 17, under UN guidance, envoys from both sides and a number of independent political figures signed a deal for a unity government. It calls for a 17-member government, led by businessman Fayez el-Sarraj as premier, based in Tripoli. With the new government in place Libya can appeal for international intervention. Until then, a decision to intervene must be approved by the UN Security Council. There are reports the intervention has started to breach the international law. On Jan.3, the Daily Mirror reported British special operations teams (SAS) are already operating in Libya preparing for the arrival of around 1,000 British infantrymen to be sent against IS there in early 2016. The forces including military close observation experts from the Special Reconnaissance Regiment are spearheading a major coalition offensive against the terror network. The operation will involve around 6,000 American and European soldiers and marines - led by Italian forces and supported mainly by Britain and France. A senior military source told the Mirror, «This coalition will provide a wide range of resources from surveillance, to strike operations against Islamic State who have made significant progress in Libya». Regardless of the final results of this offensive, it proves that the Islamic State in Libya is a growing threat. IS has threatened to use its location in Libya to disrupt European security and economic well-being. Due to the fractious nature of the Libyan politics, hardly any one group will be able to dislodge the terrorist militant group from its positions without outside help. With this in mind, growing calls for international intervention are to be expected. An operation appears to be unavoidable - it’s a matter of time. The IS Libyan branch is an imminent threat to Europe (Russia and the EU and NATO members) and a faraway, indirect threat located overseas for the United States. Russia and France have set a good example of close coordination in Syria. Now the events dictate the need for urgent joint diplomatic effort to address the emerged threat. Russia with its power projection capability and main European actors could form a formidable force to defeat IS in North Africa coordinating efforts in accordance with international law, if need be. An international coalition of nations united in the anti-Islamic State effort has a chance to drastically change things for the better.